We invited Ben’s parents over for dinner for a Monday night. They just arrived home from France the night before, so I wanted to make them a hearty home-cooked meal for their first dinner back. I was feeling like pasta, and originally thought meatballs. I searched out recipes but I wasn’t feeling confident that I could achieve a meatball that my father-in-law would love, especially since my father-in-law loves meatballs. So instead I decided to make a Bolognese sauce, (which is kind of like a deconstructed meatball), from a tried and true recipe. 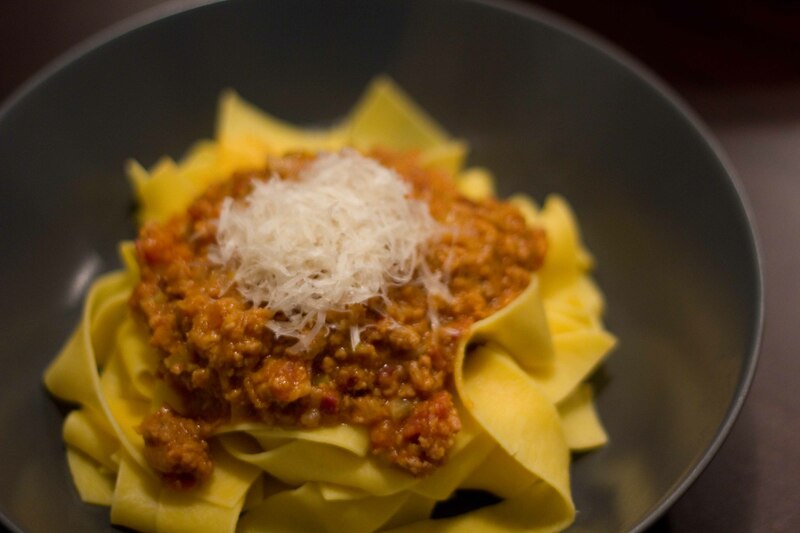 My Bolognese is based on Mario Batali’s recipe but with a few changes based on some internet research and some key finds at the market. It takes a bit longer to make and is richer than the original recipe, but I think the extras are worth it in the end. 1. In a large heavy bottom sauce pan, (I use my trusty Le Creuset) heat the olive oil over medium heat. 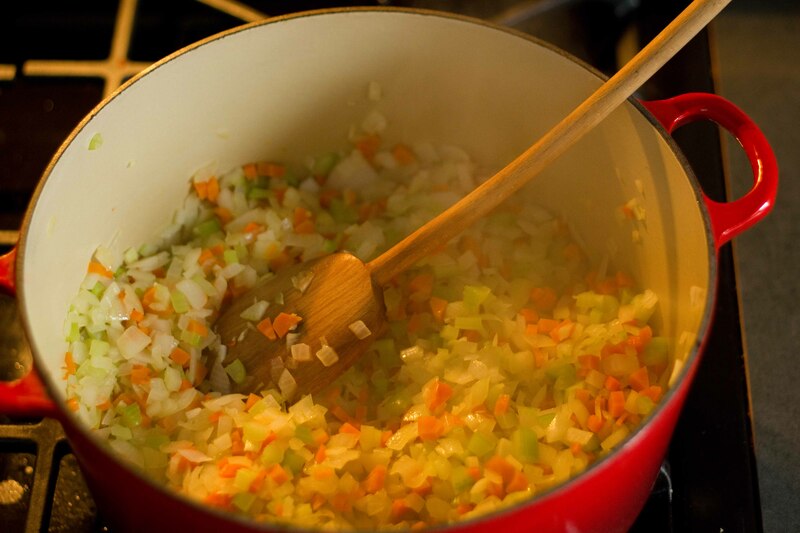 Add the onions, celery, carrots, garlic and sweat until the vegetables are translucent but not browned for 30 minutes. Watch the heat carefully to avoid burning. Soffritto sweating it out in the pan. 2. 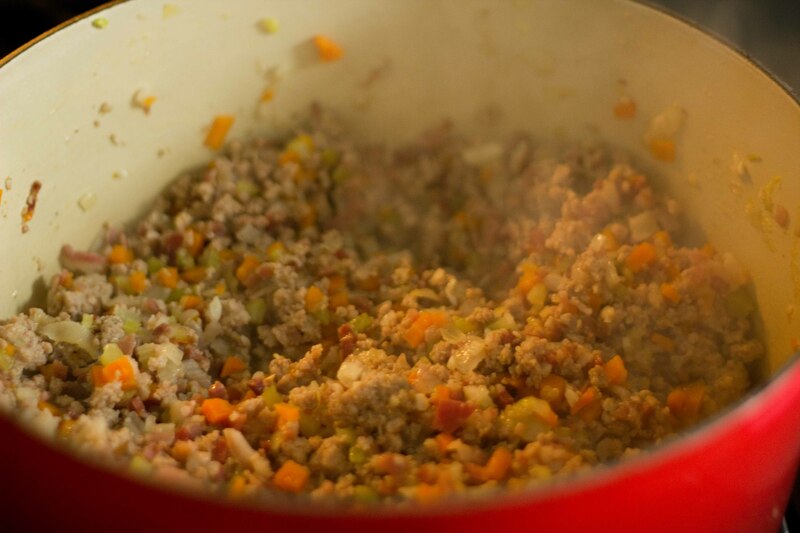 Add the meats, (whatever you’re using) to the vegetables and brown over medium-high heat, stirring to keep the meat from sticking. Reduce the heat to medium-low and continue on the heat for 45 minutes. Yummy meats in a pan. Check for seasoning but watch the salt as the cured meats adds a lot on their own. 3. Add the tomato paste, (I added a can + 2 tbsp of the concentrated paste in a tube). Simmer for 30 minutes. 4. Add milk, (I added half and half for extra richness). Simmer for 30 minutes. 5. Add wine, thyme, (I add some chili flakes and nutmeg at this time). Add 1 cup chicken stock/water. Simmer for 1 hour. Check for seasoning. 6. Serve with noodles. I usually take the noodles after cooking and mix it in a pan over medium heat for a minute to coat the noodles and disperse the sauce. Top with Parmesan. Unfortunately I got caught up at the end and missed this step. You can see we didnt mix the sauce into the noodles. Dont forget, it makes a difference in the overall taste of the dish.